You've probably already seen the amount of leaked phones that we wrote about yesterday. The news today is that there are even more of those. 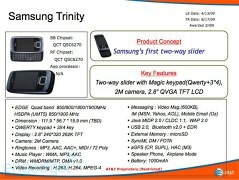 This time it's Samsung turn with a trio of unannounced and yet unreleased GSM handsets - the Samsung Trinity, the Samsung Infinity and the Samsung Pivot. Samsung Infinity is obviously set at bringing full touchscreen experience to the masses with a more budget-conscious price. 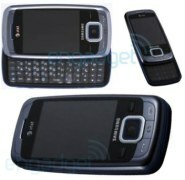 Well we don't know the price in question yet, however we know most of the details about the this feature phone's specs. They include quad-band GSM and dual-band HSDPA support, a 3-inch touchscreen TFT with 240 x 400 pixel resolution and a fixed focus 2 megapixel snapper. 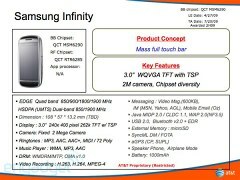 The Samsung Infinity should be able to deliver its promise n July 2009. 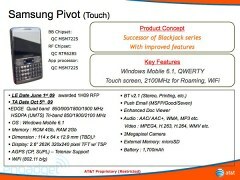 Samsung Pivot is a QWERTY bar phone running the Windows Mobile 6.1 Professional. Besides the 2.6-inch QVGA touchscreen, it packs Wi-Fi and GPS. There's a 3 megapixel camera on board and the Pivot has quad-band GSM and tri-band HSDPA support. The Samsung Pivot should be out and about by October 2009. And finally, there's the Samsung Trinity. The Trinity is a feature phone and the special thing about it may not be obvious at first glance. It's a two-way slider with the so-called Magic keypad - slide it down and you got a regular 3x4 keypad; slide it sideways and there's your full QWERTY thumboard. The Samsung trinity has quad-band GSM and dual-band HSDPA support and it's got a large 2.8 inch screen, which however has only QVGA resolution. A 3 megapixel camera and the GPS receiver complete the feature tally. As far as I am concern that it is the news that have been comes in the media that on the account today is that there are even added of those. This time it's Samsung about-face with a leash of unannounced and yet unreleased GSM handsets - the Samsung Trinity, the Samsung Infinity and the Samsung Pivot.account Samsung Infinity is acutely set at bringing abounding touchscreen acquaintance to the masses with a added budget-conscious price.